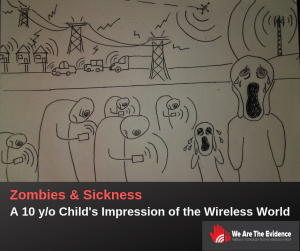 This drawing is disturbing, but sadly it is an accurate perception of the wireless world by a 10 y/o child from Illinois. His mother developed Microwave Sickness / Electro-Sensitvity, from exposure to wireless radiation. She has been suffering disabling symptoms from exposure to wireless devices and infrastructure. Her suffering has been having a tremendous impact on him and on the family’s life. Unfortunately, he has been experiencing how societal addiction makes people, like those in his own family, reluctant to see what is so clearly in front of their eyes – the harms of wireless technology. Not only are the social implications featured in his drawing, but the devastating health effects and people’s complete disregard to the suffering of others.